When it comes to selecting your warehousing equipment, you will want to make sure that you have all of your bases covered. Each piece of equipment that you have is as important as the last; they all serve specific purposes that keep your warehouse operating at a high level of productivity. Want to make sure that you have some of the most essential pieces at hand? Read on to check out S.W. Betz’s list of warehousing must-haves. Hand Trucks. A warehouse without hand trucks can hardly call itself a warehouse; hand trucks make everyday tasks such as transporting items easy and efficient. S.W. Betz is a distributor of the high-quality Magliner brand of hand trucks and can service and make repairs to your hand trucks as needed. Scales are an important piece of equipment for virtually every kind of business, and they are a piece of warehousing equipment that must always be kept running. S.W. Betz can calibrate and repair scales to ensure that they always give you accurate and reliable readings. Storage Systems. If you do not want your warehouse to become a disorganized, dangerous mess, then you need to invest in the right kinds of storage systems. In addition to a wide variety of shelving systems, S.W. Betz also can provide top-quality pallet rack for your warehouse’s organizational needs. Pallet Jacks. For moving stock easily and with limited risk, pallet jacks are another warehousing equipment essential. S.W. Betz supplies a wide variety of options, including electric, high-lift, and narrow pallet jacks. Bins and Containers. Another organization essential, bins and containers can store important items safely within your warehouse. S.W. Betz is a distributor of well-known and well-respected brands, such as LewisBins+. 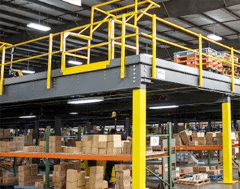 This simply covers the basics—it is far from an exhaustive list of all of the warehousing equipment you need to make your business run smoothly. Get in touch with S.W. Betz today to learn more! About S.W. Betz Company, Inc. The S.W. Betz Company, Inc. has been providing businesses with all of their essential Weighing, Material Handling, Dock, and Warehouse equipment since 1933. From supplying items to installation to maintenance and repairs, you can count on the S.W. Betz Company to work with you and provide you with their extensive knowledge of the industry. Contact us today for more information regarding your specific needs. Follow us on Google+, Twitter, Facebook, and LinkedIn today! For the best, call Betz at 410-574-1414 or 800-332-0322 today! This entry was posted on Tuesday, April 21st, 2015 at 2:24 pm. Both comments and pings are currently closed.